Wicked Edge Precision Knife Sharpener | Topic: Not really getting started. But more of a revamp. Not really getting started. But more of a revamp. Recent › Forums › Main Forum › Getting Started › Not really getting started. But more of a revamp. This topic contains 7 replies, has 2 voices, and was last updated by Todd 12/06/2018 at 7:45 pm. I bought my original setup in 2011. I have used it with some success but it is a pain to set up and haven’t used it as much as I would like. I also have a number of flat ground blades and the vice design of the old school version I have is a pain because it shifts the blade to the side unless I spend a lot of time shimming the blade. I know without a doubt I will always have knives and will always want them to have a good edge. So I am thinking of spending even more and getting the Gen 3 Pro sharpener and using all my existing paddles etc. That solves my flat ground blade problem and seems easier to set up so I might use it more. Below is the line item from my receipt showing the version I bought back then. I also added the better arms with micro adjustment. Does anyone foresee a newer version of the Gen 3 Pro coming out soon???? Maybe Clay can respond. But I would really hate to spend all that on the Pro sharpener to replace what I already spent only to have something else come out soon. Not sure if the current discount on this sharpener points to a holiday sale or maybe clearing stock for something new. Any other opinions on this upgrade path? Todd, I think you should consider upgrading your “standard” vice you now use with the WE130-Gen 3 Vice for $230. Since you already have compatible rod arms and a compatible mounting platform, with loosening a couple screws you can have your setup with the newest Gen 3 Vice System offered. It’s the same vice utilized in the Gen 3 Pro model. Everything you have now is compatible with this WE130 Gen 3 vice. You’ll gain the quick and simple vertical clamping process with no blade lean and no shims needed. 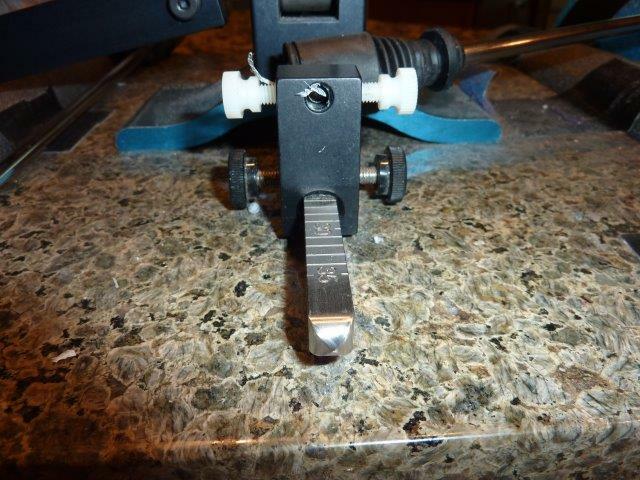 That vice upgrade features the split jaws for improved blade grip along with the tension adjustment feature. You will continue to set and adjust the guide rod angles in the same manner you’re experinced with. It’s a good afordable option. Quick and simple to do. That option would allow you to sharpen a larger variety of bevel types and knife grinds then the more expensive Gen 3 Pro. Thanks @MarcH. I wasn’t sure there was an upgrade available to get the new jaws on my base. I just went went through the VERY handy upgrade selector in the WE store and it looks like based on my exact configuration, I have 2 paths. $355 gets me new jaws, longer arms, AND new ball joints. The joints I have include the two back thumb screws on the side. One of which locks down the micro adjustment set screw. I think it was labeled the pre-2017 model with micro adjustments. Definitely a couple options to consider. I have and still prefer to use the older larger mini “L” brackets with the screw thread locking system like you have. I have substituted the metal black knobbed locking screws with nylon knurled knob thumb screws. I use two of these nylon screws on each side, opposing one another, one threaded into the front facing side hole and another one in the rear hole. The nylon holds the micro adjustment tightly between the two tightened opposing nylon screws. Without the worry of buggering the threads. I’ve used this method for a couple years now without problems. The nylon screws will save you some bucks by not replacing the brackets. The longer guide rods I use also. I also use the opposing screws on the square bar. Looks like a great solution. Will have to head to the hardware store and look for some of those. I did cut them shorter using a sharp razor knife pressed hard between the threads to make a starter cut. They’ll just snap at the cut. Guess I should have made a decision sooner. The gen 3 Pro went back up to $899 from the sale price of $799. There wasn’t a date range on the sale but clearly I missed something. Did order a pack of 10 of those plastic screws. Got the 1/2 inch long ones. I measured and they appear to be able to make contact with the adjustment screw and still have a handful of threads to spare. But not so many to get in the way.